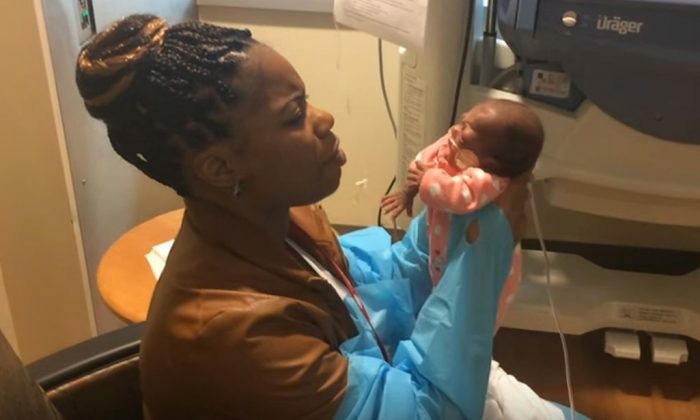 The Carolinas Medical Center in Charlotte says there’s been a major milestone for E’Layah Faith Pegues, who is the smallest surviving premature baby ever to be born at the hospital. The girl was only 10 inches long and fit “head-to-toe” in his palm, he said. The girl survived and weighs around five times more than her birth weight, and she now weighs approximately 3 pounds. Her parents have been able to feed her and spend time with her. According to WSOC-TV, her parents did not have an easy pregnancy. Smith and father Eric Pegeus found that E’Layah was no longer growing in August. During the first two weeks, she got blood transfusions and started gaining weight slowly. The past three months “have been a roller-coaster” for Smith and new Pegeus, she said.. But “every precious moment spent with our daughter has made everything worth it,” Smith added to ABC News. Smith said she believes her daughter will grow up to be a normal child. “I know she will be something special, whether it’s running on the track, ballet lessons or even basketball,” she said. Herman said her survival is growth to a “combination of talent, perseverance, and creativity,” according to WSOC. “Our goal since her birth was to grow her as quickly and as safely as we could,” added Herman.